Cooking for someone on a special diet? With Taste of Home Diabetes Family Friendly Cookbook it’s a snap to serve mouthwatering sensations that everyone at the table will savor…whether they’re following a diabetic diet or not. That means you can make one comforting meal for the entire family! Best of all, these recipes come from home cooks who are happy to share the satisfying favorites their families adore! Satisfy everyone at your table with 514 recipes so delicious, no one will suspect they're eating right! •514 dishes so tasty, the whole family cheer! No feeling deprived. And no separate meals! 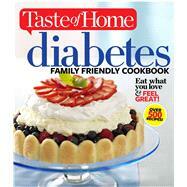 •Diabetic Exchanges and Nutrition Facts with every recipe make meal planning a snap. •Indulge in more than 60 snacks and desserts, each approved by a Registered Dietitian. •Savor pasta, barbecue, meat loaf mashed potatoes, sweets and more without guilt!